Co-teachers who take risks together, grow together. 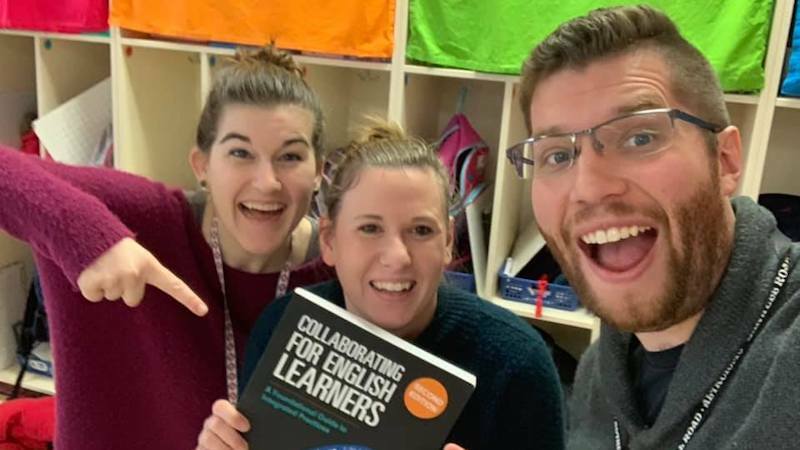 Three years ago, to more effectively serve our English Learners, the three of us—Allyson (ESL), John (2nd grade), and Ashley (1st grade)—began co-teaching. And, if we’re being completely honest, we really had no idea what we were getting ourselves into. We quickly learned that co-teaching takes time, dedication, and adaptability as well as constant effort, communication, and flexibility. Marrying teaching styles, perspectives, and different sets of expertise is complicated and often challenging. Yet, we’re here to tell you from experience—it’s worth it. We are better teachers because of co-teaching and our students have shown unprecedented growth. First things first: When you begin co-teaching you may or may not know your partner on a personal level. Building that relationship, both personally and professionally, is key to successful co-teaching. Trust can make or break you and establishing that trust takes time and effort. Put in the work. Invite your co-teacher to grab a coffee outside of school. Get to know each other as people. Share your favorites. It may seem arbitrary but don’t skip this step! The best co-teachers know and trust each other completely. For ideas, try this fun 15-Day Co-Teaching Challenge! It might seem basic, but this is one of our most important co-teaching tips. Use the language OUR classroom, OUR students. Change your language, change your mindset. In order for both teachers to be viewed as equals, you have to speak it into existence. The language you use helps shift your mindset towards the belief that the class and classroom space belong to both teachers. 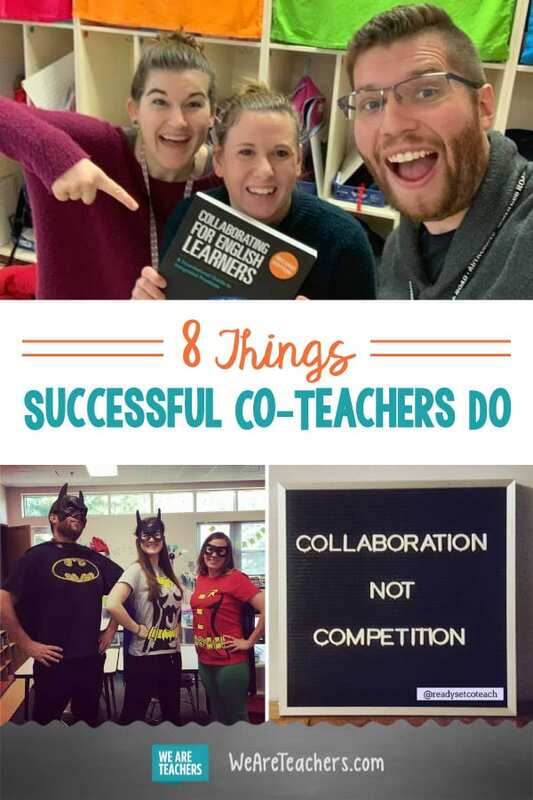 Your students and your co-teaching partnership succeed because of both of you. What are your expectations for your partnership? How will you manage your co-taught classroom? These conversations are not only vital to establishing parity, but also to building a classroom environment that is consistent for your students. Successful co-teachers set themselves up for success at the beginning of the year by putting a plan into place and having the tough conversations. It may not always be comfortable, but it’s necessary. Try using a co-teaching contract to make sure that you hit all of the important pieces. The little things that might not bother you, may make your co-teacher crazy! The rules shouldn’t change when your co-teacher walks in the room. Norms should be agreed upon and consistent. Otherwise, you may just find yourself pulling your hair out when the kids only bring their work to you or your co-teacher corrects a behavior in way you don’t prefer. These things may be small but they make all the difference. Think of setting up a classroom management plan alongside your co-teacher. What do we do when someone blurts? How will we reward students when they do well? How should we make transitions? What are your biggest pet peeves? Plan everything out at the beginning to avoid frustrations later. Parity’s general definition is the state of being equal. When that is applied to a co-teaching model it refers to the equality between the two teachers delivering instruction to the same class. Believe it or not, parity may just make or break your co-teaching dynamic regardless of the quality of your instruction. In order to establish that parity, your co-teaching team can take some concrete steps before the school year even begins. Consider the impact that having both teachers in the classroom for a Meet-the-Teacher or Open House night. Introducing yourself to parents and students using the pronouns of “we” and “us” will go far in establishing parity. If your school does not offer these opportunities, then send out a welcome letter stating that their child will have TWO teachers this year. Go a step further, analyze the physical layout of the classroom. Do both teachers have a physical space where they can store their teaching materials? If not, then consider how small steps impact student perception. Taking concrete steps before the start of school will go far in presenting your co-teaching dynamic as a unified team. When true parity has been established, the students will not realize why the specialist is there and will see both teachers as their teacher, parents will be comfortable contacting either teacher and staff members who visit may not even be able to tell who is the classroom teacher and who is the specialist. No two teachers are the same and each of us have our own defined teaching philosophy. Some of us can surgically create a line of questioning to broaden a student’s understanding, while others run and jump on a table to engage a class of students. Expecting both teachers to completely match their styles is unrealistic. Luckily for us, there are many different co-teaching models to make use of our differences. Take the time early on in your co-teaching dynamic to have the conversations about strengths and weaknesses. Keep that knowledge of your co-teacher in mind whenever you are co-planning a lesson. If you capitalize on each others strengths, you will find instruction to be stronger and more impactful. In order to foster a growth mindset and encourage risk-taking in our students, teachers must be willing to take risks themselves. Taking risks, and even failing in front of students, demonstrates that not everything always goes as planned and making mistakes is part of the learning process. Modeling for students how to fail gracefully instills perseverance and mindfulness in our students. Taking risks can be uncomfortable, but the beauty of co-teaching is you’re in this together. Try new strategies, activities, ideas, or student groupings on a regular basis. Then, reflect as a pair. Co-teachers who take risks together, grow together. One of the biggest challenges of co-teaching is scheduling. As a teacher it is already hard to find time to plan, assess, reflect and meet with parents and working around your co-teacher’s schedule only adds to this. It is important to remember that even when carefully planned, things happen that are out of your control. Ask yourself, how often do things really follow a set plan in school? We as teachers need to be ready to change our lessons at the drop of a hat in order to meet our student’s needs. Be willing to adapt and change when challenges are thrown at you. Communication is key when these situations arise. Real life happens, which is why it is important to communicate with your co-teacher. Try to be understanding when your co-teacher has something come up and be willing to work around it. It is important to make sure that you are always growing and learning together as co-teachers. When you are co-reflecting, try to find something that you could both improve on and participate in professional development opportunities as a team. Co-teachers have the unique opportunity to try new things together and the students will benefit as you fill your teacher toolboxes with new ideas and strategies. Whether it’s a webinar, a conference, observing another professional or inviting visitors to observe or give you feedback, find ways to develop your expertise and evolve together. We’ll leave you with this: Co-teaching is like riding a tandem bike. It brings together teachers with different expertise, talents, strengths, and abilities to synchronize instruction for the benefit of all students (Dove & Honigsfeld). Begin with a shared vision for equitable learning practices and enjoy the ride! We’d love to hear any co-teaching tips you might have. Come and share in our WeAreTeachers HELPLINE group on Facebook. Plus, how to deal with a difficult co-teacher.